On January 6th, the first Sunday of the year, SEANBC Thailand team went to visit the New Light Methodist Church in Kanchanaburi province. The church was started by a young and visionary pastor who had just graduated from a Bible school in Bangkok about a year ago. After learning about our Mobile Educational Program from one of his former professors, pastor Pinit became interested in the program and reached out to us for further information. In the process of learning about the program, Pastor Pinit felt the need to enroll in the program to personally find out if the program was as good as advertised. 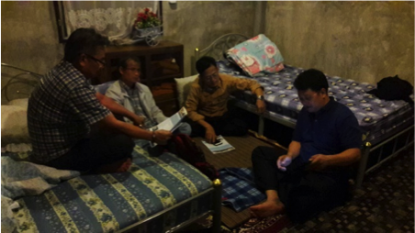 As he was finishing up the first subject, he gave us a call and invited SEANBC Thailand team to visit his church to introduce the program to his members. We accepted his invitation and preached at his church on that Sunday. As a result, a core group of members signed up for the class with pastor Pinit serving as a proctor. We see great potential for growth in the enrollment as those members began to tell their friends and families about the program. Ajarn Suvit and I visited the Bangchalong church on January 13, the following Sunday, as suggested, to join the church in their worship service in the morning and to observe how the teacher, as well as the proctor, handled their classroom activities in the afternoon. We came away well-blessed. The same can also be said about our visit to the Samrong church on January 20. The church may be small in its attendance and size but the potential for growth and the liveliness of their worship service is second to none. We could feel the strong relationships among a core team and an attempt to get the right people in the right places. These are some of the vital signs and ingredients for growth and expansion. Our trip to the north from January 21 to 23 was nothing short of divine providence. There was some slight change in the schedule; however everything seemed to pan out a lot better than we expected. Suvit and I spent the whole day meeting with teachers and leaders at Maeteang learning center. The Maeteang learning center looks more equipped now than before with a new generation of leaders who share a common vision and passion for discipleship and leadership development. Ajarn Suvit and I spent the rest of our remaining time introducing the Mobile Educational Program to five pastors from five churches in five different areas, namely, Chiangmai, Lampang, and Lampun. These five pastors represent five major church groups scattering in the three strategic provinces. They agreed in principle with our educational program and philosophy and were willing to cooperate with SEANBC in equipping their members using this educational model. These pastors have invited us to visit their individual churches and introduce the program to their respective congregations. In our humble opinion, there is an urgent need to follow up on this partnership if we wish to be successful in our endeavors. It’s always better to strike while the iron is hot! Let’s continue to pray for greater strength and wisdom from above as we carry on our God-given responsibilities. Submitted by Ajarn Suvit A. & Dr.Daniel S.